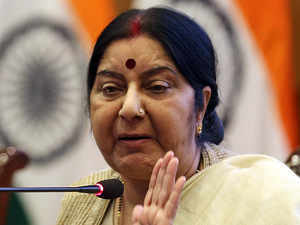 Prime Minister Narendra Modi gave a strong retort to his British counterpart Theresa May on Vijay Mallya's extradition case, External Affairs Minister Sushma Swaraj informed on Monday. "Prime Minister Modi told British Prime Minister that UK courts asking about the condition of Indian jails is not right, as these are the same prisons where they had jailed our leaders like Gandhi and Nehru," Swaraj said while addressing the media on the completion of 4 years of the National Democratic Alli ance (NDA) government. Prime Minister Modi's stern message to the British PM was conveyed when the two leaders met in London in April, during the meeting of Commonwealth Heads of Government Meeting (CHOGM) and discussed Mallya's extradition, wherein he had complained to the UK courts about the conditions of Indian jails. Liquor baron Vijay Mallya is absconding and currently living in the United Kingdom. His assests in India have been seized by the Indian authorities as he faces money laundering charges to the tune of more than Rs 9000 crores. Swaraj also added, "We have sent out Mallya's extradition request. One of the cases in the court is by the State Bank of India (SBI) consortium, which involves 12 banks. They have won the case and the money can now be recovered." In April last year, Mallya was arrested by Scotland Yard on an extradition warrant. Apart from this case, the High Court of London on February 12 ordered Mallya to pay an estimated USD 90 million to a Singapore-based aircraft leasing company in claims. The case involves a number of aircraft leased by Vijay Mallya's now-defunct Kingfisher Airlines from BOC Aviation in 2014. Mallya is among 53 persons, who are facing prosecution complaints from the Enforcement Directorate under the Prevention of Money Laundering Act, 2002, and they are absconding, the Ministry of External Affairs (MEA) had said in July last year.